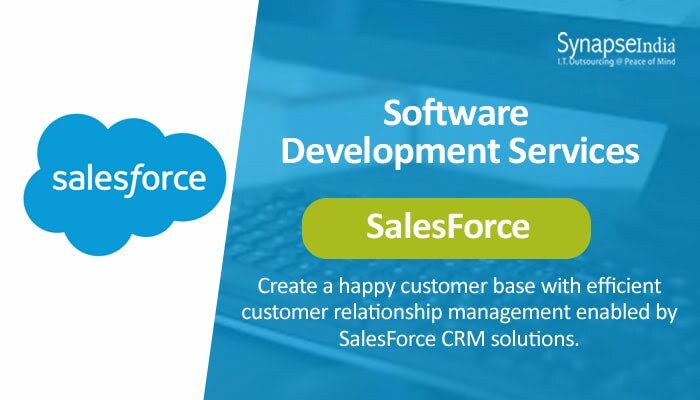 SynapseIndia understands the importance of technology like SalesForce in the communication of businesses with customers and provides software development services accordingly. Software solutions have become crucial when it comes to a dialogue with potential clients, existing customers and other businesses. Historically, investment in technology has proven crucial to the growth of a business regardless of its type and size. Business, especially the small and medium-size ones, should note that the implementation of technology should not be expensive. The technology should be created in such a way that it suits the operating requirements of a small business. The drastic impact of software technology can be gauged from the astronomical increase in popularity of cloud computing. The cloud has become a universal phenomenon across all industries, irrespective of the type of service and product they offer. Developers at SynapseIndia understand that enterprise software should be efficient in terms of functionality. The solutions crafted by them allow the end users to easily achieve the goals they want to achieve through technology. The programmers have software development proficiency across different dimensions, such as speed, scalability, and functionality. SalesForce development services offered by SynapseIndia are focused on creating a personalized and comprehensive customer experience. The CRM platforms built by the company boost customer relationships through an easy-to-use software solution.